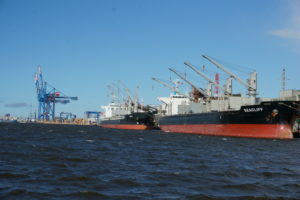 The Baltic seaport of Klaipeda is to be expanded and the Lithuanian government intends to establish a special working group to supervise the project, causing a major disagreement between the Port Authority and the city of Klaipeda, informs The Baltic Course. “A project coordination and monitoring group will be set up in the near future based on a government resolution. It will include all decision-makers. We will meet once a month and look at how the project is advancing,” Prime Minister Saulius Skvernelis said at a press conference on Friday after meeting the top officials of the port and the city. The port and the city differ on the port’s development. Last July, the City Council approved a draft of a general plan that does not envisage building an outer port in Klaipeda in the next 10 years. However, in February 2017, the Klaipeda Port Council adopted an expansion plan involving the development both in the southern and northern parts of the city, including building an outer port in Melnrage. Later, it was endorsed by the Transport Ministry. Now, Klaipeda Mayor Vytautas Grubliauskas, who previously spoke out against fast decisions on an outer port, says that he expects it to be built. “I believe that Lithuania will have an outer port,” he is quoted to say. The port is constantly growing. In 2016, Klaipeda handled 40.14 mln tons (+4.2% to 2015), a historical record. This year the port expects an even higher throughput, about 41 mln tons. While the neighbouring ports of Latvia and Estonia suffer a drop in volumes due to loss of Russian transit, Klaipeda does not depend so much on the Russian cargo flows attracting Belarus transit instead. Klaipeda remains the leader port of the Baltic countries in terms of container handling. Its throughput in 2016 was 443,300 TEU, up 12.9% to 2015 and a little less than in 2014, when the port handled an absolute record of 450,000 TEU since 2005. The throughput of neighbouring Riga in 2016 was 385,000 TEU and Tallinn – 202,000 TEU. For the latest statistics please see the detailed comparison below. Of the two stevedoring companies that handle container volumes in Klaipeda, the largest one is Klaipedos Konteineriu Terminalas accounting for 60% of all container traffic shipped via Klaipeda. The terminal of 450,000 TEU annual capacity serves 40-50 container vessels per month. The other one – Klaipedos Smelte – handles the remaining 40% and has Terminal Investment Limited (TIL), a MSC terminal operating company, as a major shareholder. In early 2016, China Merchants Group sought to buy a controlling stake in Klaipedos Smelte, but TIL did not agree to give up control on the company and the deal has not been made in the end.